This semester, take exams with zero tension! Blog: This semester, take exams with zero tension! solution jo mila toh saala question kya tha pata nahi! This is the reality with the existing book and notes available to the despaired engineering students. With exams around the corner and very little time on hand to complete the entire syllabus, reference books seem like an abyss- vast, deep, fat and huge. But what engineers in dire need of are GOOD books! Books that are crisp, books that are deep yet give you easy answers and books that need no searching for your syllabus or topics, because they are customized according to your university course. That's where I introduce you to our much needed and much followed KT280 - your end to end solution for this semester. With KT280, I guarantee you time-saving if nothing else. The other day I came across a conversation between two engineering students in the Mumbai local train. They were worried about the availability of books in nearby stores as exams were near. We have a solution to students' woes. 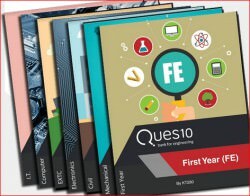 Now the books are available for you to read online on Ques10 app. You can download it from play store and start preparing for your exams in no time! We run various discount offers throughout the year to help you get the best books at the least cost. Use the coupon code: MEET31 on checkout and enjoy a good discount. Friends, a stress-free exam happens when you are confident about your preparations. It's like a cycle whose starting point is good notes and the endpoint is easy exams. And that's why we are here- to alleviate your exam tension, bring it down to zero and help you reach the exciting 80 on 100 scores this semester with Ques10!